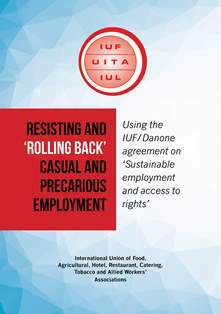 The IUF has produced a 4-page guide to accompany the IUF-Danone Agreement on Sustainable Employment and Access to Rights. The guide summarizes the contents of the Agreement on Sustainable Employment and contains suggestions for unions on how to use the Agreement in the workplace and what to do in case of resistance by management. Click here to download the brochure. When printing, please select "print on both sides" and "flip on short edge".